Reflections on fame by a woman who witnessed its effects on her parents, lived in its shadow for many years, and then studied it as a psychological phenomenon. Erik H. Erikson’s book Childhood and Society (1950) made him a celebrity when his daughter was 13. Young Sue was uneasily aware that the public image of her parents as an exceptionally gifted couple with valuable insights into human relationships was at odds with her experience of them as real, tormented people with unresolved issues. The most painful of these concerned the Down syndrome baby her mother gave birth to when the author was five. He was immediately placed in an institution, but her parents told her the baby had died, and she did not learn the truth for eight years. 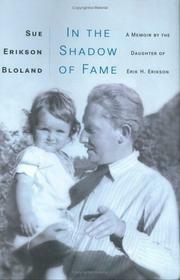 This abandoned, handicapped child, Bloland believes, was the emotional centerpiece of Erikson family life. The appearance of normality was essential to her father’s professional reputation; she was instructed never to misbehave in public, never to act in any way that might indicate that her parents were other than ideal. The author was well into adulthood before she understood the harmful effects of such stultification on her own sense of self-worth. In addition to recounting what it was like growing up in such a household, Bloland delves into her parents’ pasts, finding in their early experiences of parental rejection the explanation for their overwhelming need to be admired by others and to achieve fame. In time, as Boland underwent psychoanalysis and trained to become a psychotherapist, she concluded that a paradoxical relationship always exists between an idealized public image and the private self. As a professional, she decided to focus her attention on issues related to fame, the drives associated with it, and its emotional fallout. Her thoughts on those matters make up the later chapters, which are likely to be of interest primarily to other mental-health professionals. A memoir of potentially broad appeal muffled by theoretical material: the latter belongs in another book.